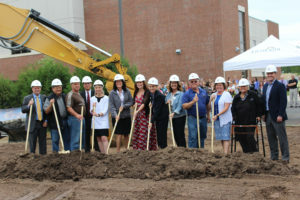 June 29 marked FirstLight’s ground breaking celebration for its major phased construction project that was announced last fall. Breaking ground for the Mora Hospital expansion with Board Members. When complete, the expanded Mora campus will encompass a total of 195,000 square feet. Of that, approximately 71,000 square feet will be either new construction or remodeled space. Planning and discussions for this project started in 2013 citing improvements to the infrastructure, patient access, services, security and technology. The project, expected to last two and one half years will cost approximately $62 million, and will not use any tax dollars. The FirstLight team and its construction partners have completed the final stages of the planning and approval process. Since last fall, they’ve been busy undertaking the necessary site prep work and while they had hoped to break ground as soon as the snow melted, the team decided to broaden the scope of the project even further. 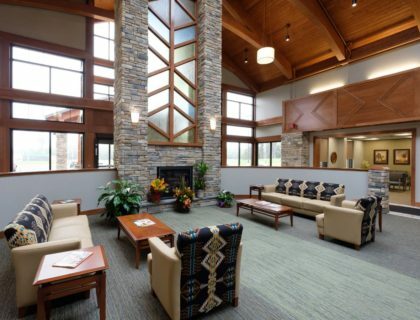 The original renovation project included new inpatient, rehabilitation, Emergency Department space along with a centralized entrance, some renovation of existing spaces and now will also include additional space for the clinic. DSGW Architects and FirstLigth’s construction lead Kraus-Anderson worked to finalize the design, phasing and approval processes. “We are excited to finally move forward with this project. FirstLight has invested heavily in our services and is committed to offering the best medical care in East Central Minnesota. We take pride in being able to offer specialized services in this area, helping our patients get well sooner and they don’t have to travel far to receive great medical care,” said CEO, Randy Ulseth. For the most current information about this project, check FirstLight’s website: firstlighthealthsystem.org/expansion, follow them on Twitter and or like their Facebook page.